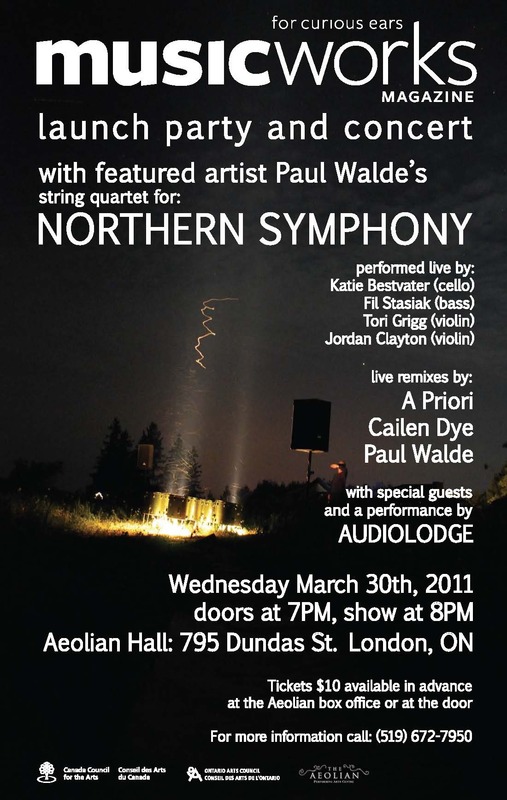 Musicworks magazine and CD launch at Aeolian Hall on Wednesday March 30th at 7PM, featuring performances of the Northern Symphony string quartet score by Katie Bestvater (cello), Jordan Clayton (violin), Tori Grigg (violin), and Fil Stasiak (double bass), with remixes and interpretations of the score by A Priori, Cailen Dye, and Paul Walde with additional guests to be announced. There will also be a performance by the sound art collective Audio Lodge of which Walde is a member. The magazine has a feature length article on the audio visual work of Paul Walde and his work with Audio Lodge. The CD features the work of Walde and Audio Lodge. The Aeolian Hall is located at 795 Dundas Street in London Ontario.